When researching for our weekend away at Nelson Bay, I was so excited at the prospect of visiting the Stockton Sand Dunes in the Worimi Conservation Lands. My childhood memories of exploring sand dunes at Double Island Point and Rainbow Beach in Queensland came to mind, only the Stockton Sand Dunes appeared to have much more on offer for thrill seekers. You can go sand boarding, do a quad bike tour, 4WD tour, camel or horseback safari, which would all be amazing ways to take in the scenery. However, I had to reel in my adventurous spirit somewhat; as adrenaline activities in your third trimester may not be the best idea. Plus Braino reminded me that we always have the most fun when we just chill out and let Farley explore and splash in the water. 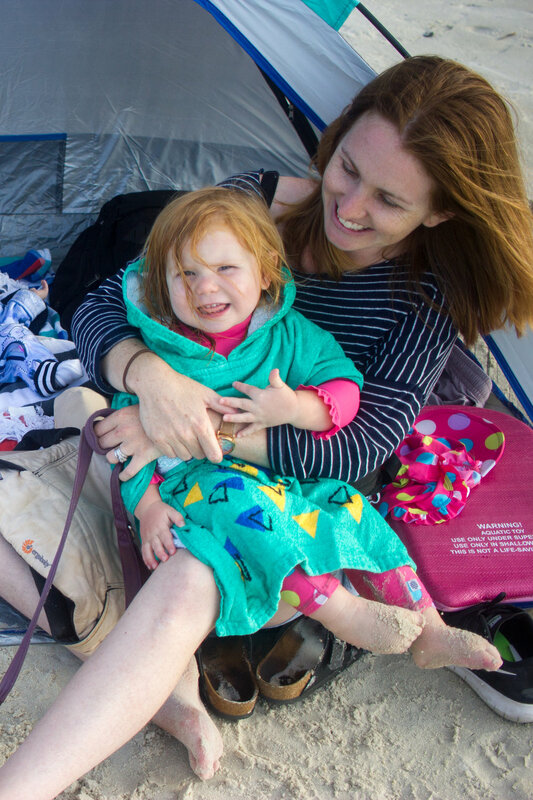 So we still headed to Birubi Point at Anna Bay, which is a 15 minute drive from Nelson Bay, and found that keeping it simple was the best way to enjoy the beach, rock pools and sand dunes with a little one. First, we headed down to the lower car park, where the tours leave from, including the camel safari. One of Farley's latest animal obsessions, second only to octopuses, is camels. One day, while I was searching for something in the garage, she found an old camel souvenir I had purchased in Egypt nearly 10 years ago and ever since she has been fascinated - we call it Zamel the Camel. (There is a camel on the Wiggles called Zamel and it always frightened her whenever it was on, so thankfully the new Zamel helped her overcome her fears) So I knew that she would really get a kick out of seeing some real life camels. The camels from Oakfield Camel Ranch wait right next to the car park in between safaris so it's really easy to get close and have a look. While children over the age of two are able to ride with a parent, Farley was technically two months too young and beside, sitting 7 foot in the air on the back of a camel isn't really ideal if you're heavily pregnant :( But Farley love just being able to see them - I'd say it was the highlight of her trip. After climbing up and over the small dunes between the lower car park and the ocean, we headed over to the northern end of the beach where we found some tidal pools amongst the rocks. 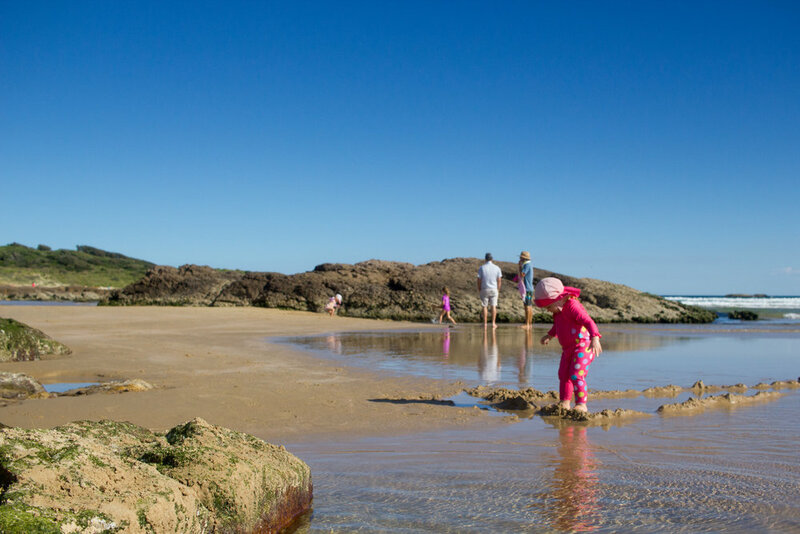 This is a great place to take your little one for a swim and a splash - the beach is generally pretty rough with waves however around the rocks there were some clear, warm pools; shallow enough for a toddler to stand in while deep enough for a parent to lay back and relax. There were a few other parents who had the same idea. The amenities at Birubi Beach are fantastic too! There are large clean public toilets and showers, a kiosk and a restaurant - Crest Birubi Beach. There is also plenty of parking. The only thing it did, understandably lack was shade. So be sure to pack plenty of sun protection. Back in late November, with the silly season creeping up on us, which would only then be followed closely by the arrive of babybrain#2, we realised that if we wanted to have a relaxing family weekend away, it was now or never. Braino managed to wrangle a long weekend from his busy work schedule (some weeks, he’s lucky to get a Sunday off) and I began the somewhat ambitious task of booking family friendly, last minute accommodation somewhere on the Central Coast. Oh and dog friendly too because the thought of also finding a kennel / dog sitter seemed impossible and I'd feel too guilty leaving our British Bulldog Costanza behind. I have to say though, we absolutely loved Nelson Bay, and the Port Stephens area in general. It was exactly what were were looking for. We booked a modest holiday house through Stayz - nothing luxurious but within our budget and totally toddler and dog friendly. It was only a 5 minute walk from Stockton Street, the main street of Nelson Bay, where you’ll find a wide variety of boutiques, cafes and a Woolworths. 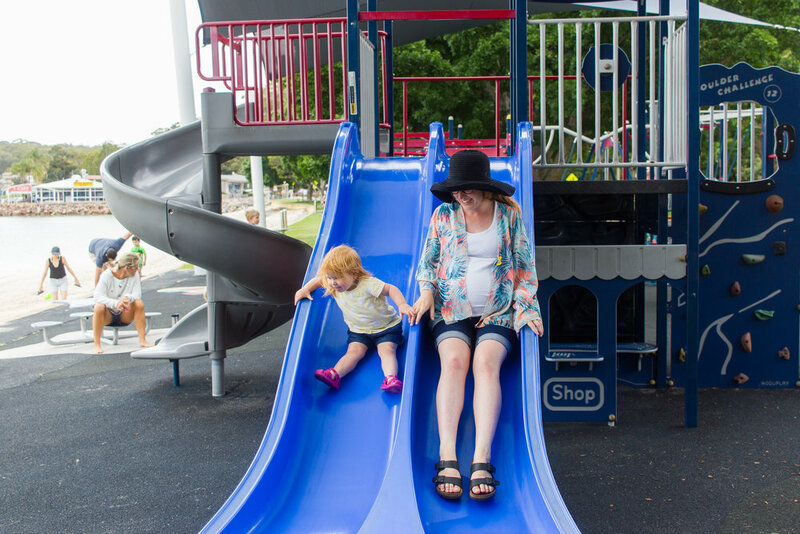 A little further on foot is the marina, where there are more restaurant options and a very popular playground that is fantastic for toddlers. It's right along the waterfront so you can see some beautiful yachts and have a splash in the crystal clear water as well. A bit further along Victoria Parade but still totally walkable, is Little Nelson Bay. An ideal beach for families, it has calm, clear water and gorgeous white sand. We had a wonderful morning splashing in the water, digging holes and filling them with water, building sand castles and of course, knocking them down. For older kids, there is Splash Waterpark between the marina and the beach. It's a modular inflatable water play area that looked pretty fun! You can also hire bikes and ride along the water front. We were keen to do this as the bikes do come with baby seats, however we just ran out of time. When the weather looked a little rainy, we decided to check out the Irukandji Shark and Ray Encounters, where you can feed small sharks and sting rays. We thought this might be an interesting experience for Farley as she has recently become fascinated in underwater sea creatures, however, unless your toddler is obsessed with sting-rays, I'd probably give it a miss. There was a group of kids around the age of 8 - 10 years old who were having a birthday party and they appeared to be having great time, so I'd still recommend it to a family with older kids. At best, it's a unique experience if you're keen for a close encounter with a select few sea creatures. At worst, it's a hot shed filled with sting rays. All was not lost though, we found a cute octopus toy in the gift ship which has quickly become one of Farley's favourite toys. 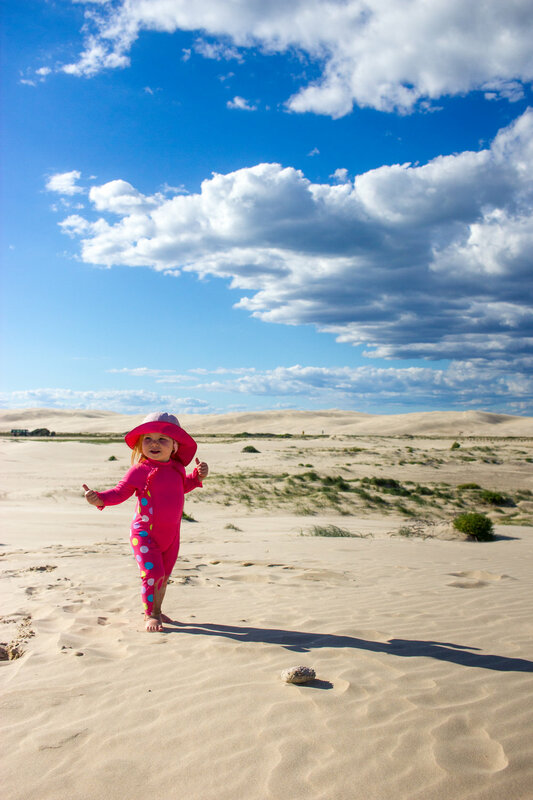 A trip to Port Stephen's wouldn't be complete without a visit to the Worimi Conservation Lands, especially the other-worldly Stockton Sand Dunes. While there is so much to see and do at the sand dunes - everything from sandboarding to 4WD and quad bike tours to camel and horse back tours; this may not seem very toddler friendly. However we had an amazing afternoon there, so I've put together a separate blog post to share more photos and and tips on what to do at the sand dunes with a toddler. Mums - if you're able to steal an hour or so to yourself in Nelson Bay, I'd highly recommended a bit of shopping along Stockton Street. There is some fantastic fashion and homewares boutiques - I think Braino panicked a little when he saw what was on offer and started to calculate how many cushions and scented candles we could fit in the car :) Grab a coffee from Ethica Coffee House or a fruit smoothie from Passionfruit Juice Bar and check out Homebody, Boho Luxe Trader, Crows Nest Home Traders and Entice U for homewares and gifts; Covet Couture, Hula Hut and Else and Me for coastal inspired fashions. Bellarose Boutique had some adorable children's fashion and gifts and I also really loved browsing in Earthquirks, home to some amazing locally made art. As for our dog Costanza, she had a wondferful time! We took her on many walks down the main street and to the park at the marina. She loved all the attention she received from the friendly locals. The house we booked was ok to have dogs inside and the yard was fully fenced with no neighbouring dogs, which is always a win! We were fairly close to the Bagnall's Beach , which is a designated off-leash beach, although Costanza hates water so we didn't get down there ourselves. I would describe Nelson Bay as family friendly, budget alternative to places like Noosa and Port Douglas. It has everything you could possibly want in a family holiday destination while still retaining a relaxed, undiscovered vibe. It was very easy to drive to from where we live in Northern Sydney but even if you were traveling from interstate, it's only an hour drive from Newcastle Airport. 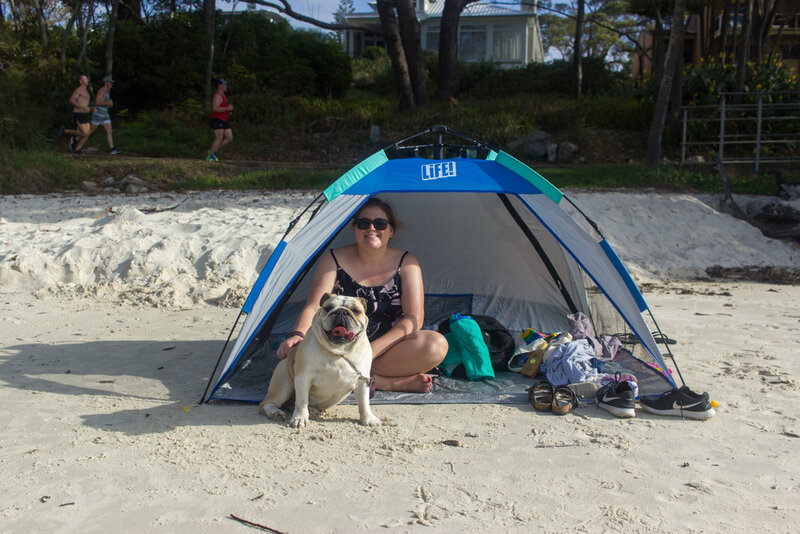 We only just got a taste of what Port Stephens has on offer during our long weekend there, so we'll definitely be back to explore more of the beaches and beautiful natural scenery.